That is one of the things I love most about you, Diana, is your genuine love for all of God's creatures. So many people go through life not seeing the real beauty of a small hummingbird. Your descriptions of the little birds are, as always, beautifully written. As for the book, I can easily imagine that someone who has dedicated their entire life to rehab for any animal would be a tremendous blessing to life that the world often overlooks. Thank you for introducing us to this book and to Terry Masear. I look forward to finding her pearls of wisdom among the pages myself. I appreciate your lovely comments, Mouse. It is often the smallest things that are the most exquisite things in life. I missed seeing those things at many points in my career. I am so thankful that I am now making up for lost time. It really is fascinating, Mary Beth. I will never look at a hummingbird the same way again (and I was already looking at them with wonder). Hummers are one of my favorite birds in the world. I'm so happy to know that there is someone who is out there looking after all the ones that are injured. They are so precious. I would enjoy this book I'm sure. Thanks Diana for a lovely review! I thought of you as I read this book and wrote my review, as I know these wondrous birds are special in your eyes. I do believe you would enjoy this book. Thanks for stopping by and commenting. Always lovely to see you. Another wonderful review of books about animal rescue, a subject you are most expert in yourself, Diana. Your personal rescue and rehabs mostly concern cats and dogs, but I understand why you admire the work of rescuers for other species. This hummingbird rescuer is the perfect example. Thank you, Elf. 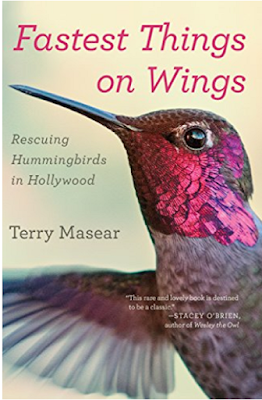 The amazing thing is that I actually had to rescue two hummingbirds shortly after reading this book (very recently). That had never happened before. For some reason, on two different days, a couple of hummers got jammed in the perching ring on their feeders. I was thankful to find them in time to help. A hummingbird will die very quickly when stressed and unable to do the necessary frequent feedings. Also, they were damaging their wings while struggling to free themselves. Both were able to fly away as soon as I released them. I sure hope they will be in good shape for their upcoming migration, as I worry that they damaged some of their feathers. As you noted, I do very much admire rescuers. I now have a whole new appreciation for hummingbird rehabbers. I'm pretty sure it must be the hardest rehab role in the world of animal welfare. I thought caring for young kittens and puppies was intense. It was exhausting just experiencing Terry's work vicariously. She is definitely one of my new heroes (and I don't use that word loosely). I have a friend who would love this book. I believe she would relate to the story! Her and her hubby are bird lovers who also had a bird named Pepper! I'll have to get this book for her. Such a thoughtful gift for your friends. Amazing that they also had a bird named Pepper. What are the odds of that? Diana, this sounds like a wonderful book. If I remember right, you are the first person to tell me about hummingbirds chasing/bombing each other. And I was excited that you had more than just one at a time at your feeder. Before that, I always thought they just came one at a time. How wonderful that you were able to find and assist the two that were caught. Hi Diana, its my first visit here. I love to read your blog post a review about the book. Well truely I love to read your post and enjoy as well as. I am reader and love to read stories and novels. After reading the blog post I had decided to read the full story and get eBooks download online copy for me.